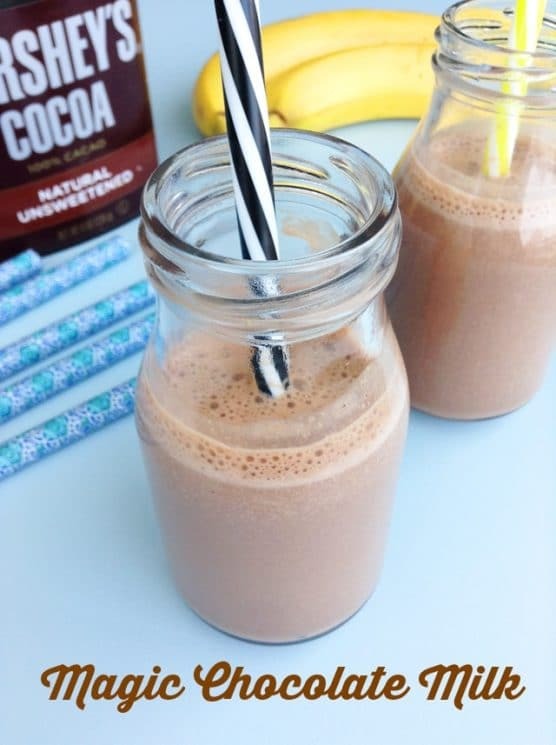 Kids love this creamy, fruit-sweetened remake of chocolate milk that tastes–magically!–just like the store-bought kind. At some point or another, you’ve probably heard your family pediatrician recommend serving your kids two cups of milk a day. Plenty of kids don’t love plain milk, though, and if that sounds like yours, it’s fine to serve yogurt, cheese, and other calcium-rich replacements instead. Still, for parents who want to encourage milk-drinking, chocolate milk can seem like a good solution. It provides the same amounts of protein and calcium as white milk in a flavor that kids find irresistible. So what’s the catch? If kids drink just one cup of chocolate milk a day, they’re consuming a whopping 23 cups of extra sugar in a year. That makes my head spin! Thankfully, there’s a delicious solution. 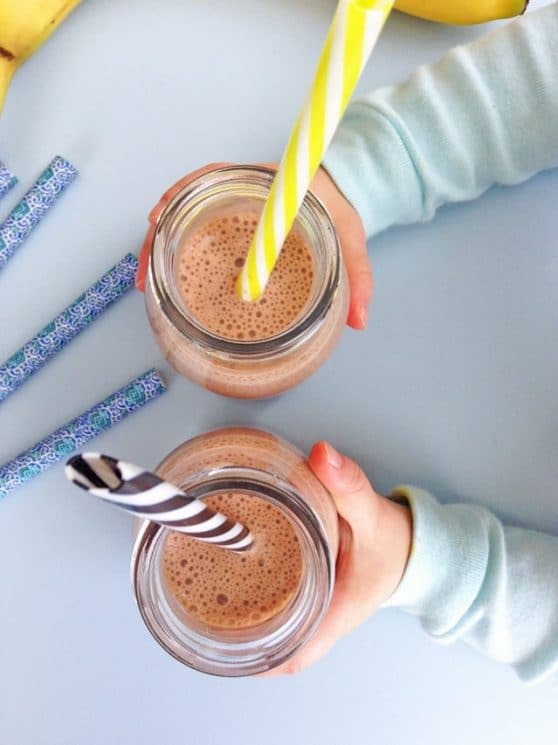 We’ve discovered a way to treat kids to a creamy glass of chocolate milk made with whole food ingredients and NO added sugars. 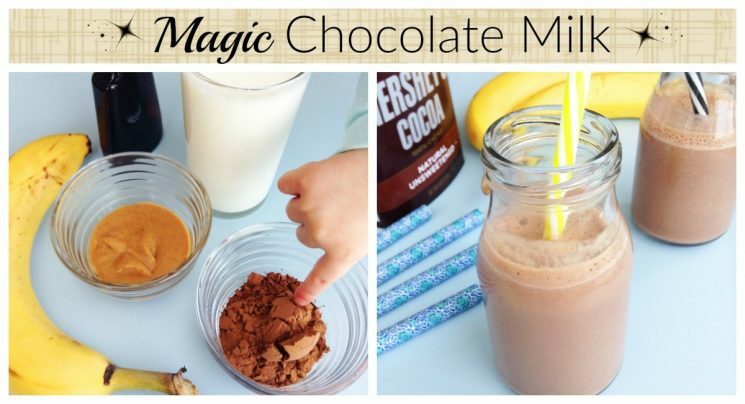 We call it Magic Chocolate Milk. I was really excited to stumble onto this amazing combination of ingredients, almost by accident. I didn’t set out to make chocolate milk. Actually, I tried to make a smoothie! What I ended up with was something so delicious that my kids and I have been sharing a blender-ful every other day for the last month. It’s that yummy! This drink delivers all the sweet, creamy flavor and texture of chocolate milk, with none of the added sugars or artificial flavors. Better yet, it includes a serving a fresh fruit (bananas) and a boost of plant protein from creamy peanut butter. Yes, I know what you’re thinking: bananas? Peanut butter? These foods have pretty distinct flavors, and they are not the flavors of chocolate milk. All I have to say is: I don’t understand the sorcery either. For some reason, this drink doesn’t taste strongly of bananas or peanut butter… it just tastes like chocolate milk! Cold, sweet, slurpable chocolate milk… want some? Our homemade version of this sweet treat is also (of course) free from the additives that can appear in commercially-made chocolate milk, like artificial flavors, food coloring (really!) and high fructose corn syrup. 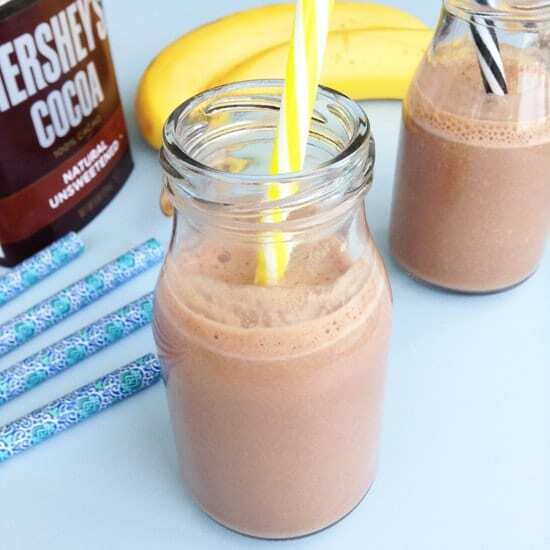 This is a quick and simple recipe, but if you really want to cast the spell of “chocolate milk,” it matters to stick to the ingredients and ratios closely. Use ripe–but not overripe–bananas, so they bring the right about of sweetness to the drink. And don’t leave out the ice, because it prevents the texture from being thick like a smoothie. The rest is easy: blend well, serve right away, and watch the smiles! Enjoy. Really excited to try this! My son hates almost all dairy, but of course loves chocolate milk. I needed a recipe like this! Do you know how long it would keep in the fridge? Either in an open glass or a sealed glass jar. Thank you for a great recipe idea? Have you ever tried it with a different fruit? I’m allergic to bananas and can’t even be around bananas to make it for my children, although I would love for them to have chocolate milk not loaded with sugar. Hi Geneva! I haven’t tried this recipe with another fruit, and I’m not sure you’d get exactly the same effect. You might be able to try adding soaked dates to sweeten is up. If you try a substitution, be sure to let us know how it turned out! You are a lifesaver! 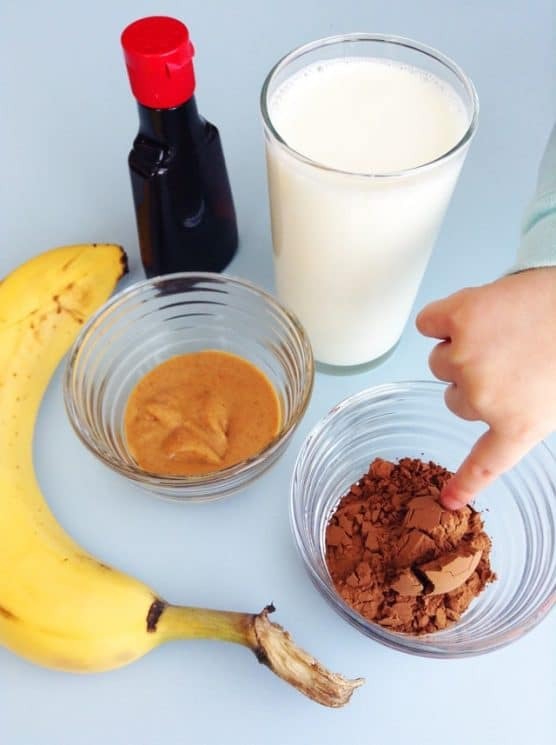 I couldn’t get my 18 month old to drink milk and when i saw this recipe I wanted to give it a try. She loves drinking this magic milk! I love to hear this Kae! Thanks for sharing. It’s auto calculated for 4 servings, but certainly, it’s closer to two servings!